Benet Casablancas (b. 1956) is a distinctive voice in contemporary Spanish music. He studied in Barcelona and later in Vienna, where his teachers included Friedrich Cerha. The Central European Modernism of Cerha is a key ingredient of his style, yet he clearly speaks from outside of that culture. There is an openness and directness about Casablancas’s music that feels at odds with the post-war avant-garde, yet there is little sense of tension between the Modernist complexity and the clarity of texture and line that the composer clearly values. Casablancas has been active as a composer since the early 80s (he’s also a well-established scholar and teacher in his native Catalonia), and this release follows several others of chamber music on various labels, including a disc of string quartets with the Ardittis on Tritó and four discs from Naxos. The present selection surveys recent works for ensemble dating from 2010 to 2014. This is highly caffeinated music: mostly fast and light in texture, and only occasionally letting up for quiet, reflective interludes, none of which last long. Casablancas finds inspiration in the visual arts—two works here are named after Picasso and Rothko paintings—yet retains a valuable abstraction, allowing his work to easily stand alone, without reference to its sources. The disc opens with Dove of Peace a “Concierto de Cámera” for clarinet and small ensemble dedicated to Picasso. 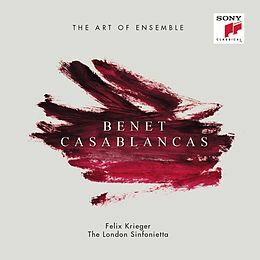 The clarinet proves an ideal vehicle for Casablancas’s light, frenetic lines, but it rarely dominates, as the composer pays equal attention to the ensemble, with each of the instruments used soloistically to construct filigree textures made up of their independent and always audible lines. The following Octeto is a shorter work, in which oboe and flute take over from the clarinet as the focus of the ensemble, achieving similar lightness and transparency throughout. Four Darks in Red, after Rothko is more knotty music, with harder accents and a more defined rhythmic profile. But that clarity of texture remains, with the harp, for example, shining through, and muted, low-pitched interjections from the trombone creating an earthy sonority, redolent of Rothko’s color palette. Mokusei Gardens, A Viennese Notebook suggests from its title a reminiscence of Casablanca’s studies in the Austrian capital, but also a Japanese influence, as invoked by occasional pentatonic lines. This is the only multi-movement work on the disc, offering a more varied range of textures and moods. …der graue Wald sich unter ihm schüttelte (The Gray Forest shook under Him) again suggests Vienna, not only in the language of the title, but also in the almost Mahlerian use of the horn, the sound here still modern but now with a distinctively Romantic hue. As with Dove of Peace, this too is described as a chamber concerto, this time with the horn as soloist. The choice of solo instrument brings a more lyrical turn to Casablancas’s writing, although the ensemble retains its light, rhythmically alert profile. Finally, Dance, Song and Celebration, another ensemble work dominated by perky, active woodwind solos. The instrumental lines feel even more independent here, though their cumulative effect is of a continuously evolving and highly variegated texture. The performances by the London Sinfonietta are as accomplished as the ensemble’s reputation would have us expect. The clarinet and horn soloists in the chamber concertos, Mark van de Wiel and Michael Thompson, find a natural affinity for the music, which is always idiomatically suited to their instruments. The recordings, made at George Martin’s AIR Studios in London, are close-up, sometimes feeling a little claustrophobic and airless (ironically), but always capturing the teeming detail of the music. Conductor Felix Krieger communicates a deep passion for this Casablancas’s work, both in his disciplined leadership and in his brief but informative liner note. The whole project represents a rare foray into the avant-garde by the Sony label, but given the approachability and directness of the music it documents, the disc should fit comfortably into their diverse catalog. Hartmut Haenchen writes in his liner note to this release that Bruckner’s attitude to tempo was based on a desire for clarity, emphasizing a vocal quality in the melodic lines, a result of his “Classicist” temperament. In practice, that means fast tempos throughout, and at less than 70 minutes, this is the fastest Bruckner Eighth on my shelf. Haenchen also cautions against “non-notated portamenti,” and duly avoids any such extravagances. Yet the written tempo markings and changes are generally acknowledged, and this is a significantly more fluid reading than many. Haenchen also takes great care with articulation, the accents often emphatic, but never arbitrary. The result is a distinctive take on the symphony, often lacking in grandeur and majesty, but generally coherent and always faithful to the text, at least as Haenchen reads it. The Royal Danish Orchestra plays with precision and commitment, though the string sound lacks character and the lower brass lacks weight—a slick, professional sound but clearly outside of the Central European tradition. The opening of the first movement feels brisk, although, as Haenchen states, he is also careful to avoid clipped notes, so we get broad phrasing from the strings, even at this pace. The tempo transitions in the movement seem to be conceived with a mathematical precision: They always function perfectly, but there is little poetry in the process. The Scherzo second movement is the most successful for Haenchen’s approach—fast again, but characterized more by the strong accents in the lower strings than by the tempo itself. The generally light textures here allow those accents to propel the music. Elsewhere, and especially in the outer movements, they tend to make the music sound merely deliberate, rather than imposing. Clear textures and fast tempos also characterize the Adagio. Haenchen’s contention that the vocal quality of the melodic lines should determine the tempo is generally vindicated here, and although the movement is over in a brief 21:47, it rarely feels rushed. That said, the portamentos that, while not notated, can be considered integral to the performing tradition, are sorely missed. For instance, when Bruckner ends a long phrase with a quintuplet turn before the cadence, surely he doesn’t need to state that the music should broaden? But in the absence of any such indication, Haenchen ploughs on. Similarly with the Wagner tuba chorales, which are integrated into the fabric, rather than appearing as moments of transcendence. Haenchen does slow and broaden for the climax, but loses the flow in the process, leading to ragged phrasing in the coda. The opening of the Finale is taken too fast for the orchestra (Haenchen this time ignoring the …nicht schnell) and it takes a while for the ensemble to settle down. Again, though, Haenchen makes a convincing case for the dramatic potential of up-tempo Bruckner, even if the relationships between his often surprising tempos are difficult to pin down. The recording was made at the Royal Danish Opera House, and the orchestra is captured in clear, if slightly dry audio. Although it is not labeled as a live recording, some audience noise gives the game away. The notes don’t tell us that this is the Nowak edition either, although the short running time is a big clue. 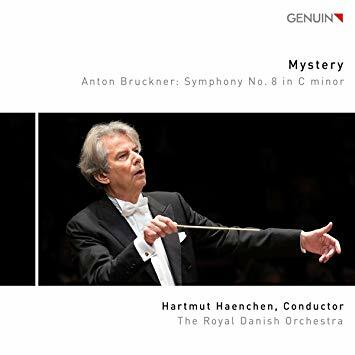 For reasons unexplained, the album carries the title Mystery, an ironic choice, given that mystery is the one essential Brucknerian quality that Haenchen’s interpretation lacks. This review appears in Fanfare magazine, issue 42:3. Hans Weisse (1892–1940) is MDG’s latest discovery from the apparently limitless number of Austro-German late Romantics who have fallen into obscurity. It turns out Weisse has another claim to fame—this one equally unfulfilled—as a music theorist, as he was one of the key figures in developing the theories of Heinrich Schenker, and to bringing them to the U.S., were they flourished. The accepted history of Schenkerian analysis has it that two of Schenker’s Vienna pupils, Oswald Jonas and Felix Salzer, left during the Anschluss and established themselves in American universities, bringing Schenker’s writings and elaborating them into the discipline we know today. But Hans Weisse fits in as the Mittelgrund level in this process. He too studied with Schenker, in Vienna from 1902 to 1919 (though interrupted by military service). After a successful academic career in Austria and Germany, he accepted a position at Mannes College in New York in 1931—and that is the true starting point of Schenkerian analysis in America. Jonas and Salzer had been pupils of Wiesse in Vienna, and when he left, initially for Berlin, both continued their studies with Schenker himself. So it was a tight-knit Schenkerian community that transferred across the Atlantic, with Weisse the stand-in patriarch, in the absence of the great man himself. As well as analysis, Weisse also studied composition with Heinrich Schenker, yet the music of both men is now almost completely forgotten. The liner note for this release, by Detmar Huchting, makes some overblown claims for Weisse as a composer, an underrated genius in the order of Dittersdorf apparently, but also says that Weisse’s name appears in no reference works, not even Grove or MGG, the latter a particularly egregious omission. Huchting’s notes go on to outline Weisse’s career as a theorist, but don’t mention his music beyond the dates of these two works. Similarly, an article in the Journal of Musicology by David Carson Berry, “Hans Weisse and the Dawn of American Schenkerism” (Vol. 20, No. 1 Winter 2003), gives an excellent survey of Weisse’s contribution to Schenkerian analysis, but without mentioning his music at all. Of the two works presented here, the Clarinet Sonata has an opus number, 10, while the Clarinet Quintet does not, suggesting only the first was published. But that seems to be all the information available on these or any of his works. The influence of Schenker is certainly felt in this music, especially in its faithful adherence to models from Brahms—a figure as apparent in the choice of genres as in the style of the music. Schenker’s traditionalist approach to tonality, and his elevation of counterpoint as a Germanic musical virtue, translates here into a flowing, lyrical style, with plenty of imagination in the thematic development, but all based on a rigorously diatonic tonal structure. Although it is probably pushing the point, it is tempting to hear this music as Schenkerian analysis made flesh, and you could certainly imagine slipping an Ursatz under this, and rationalizing the melodic lines as elaborated descending scales and the bass as decorated primary-key arpeggiation. 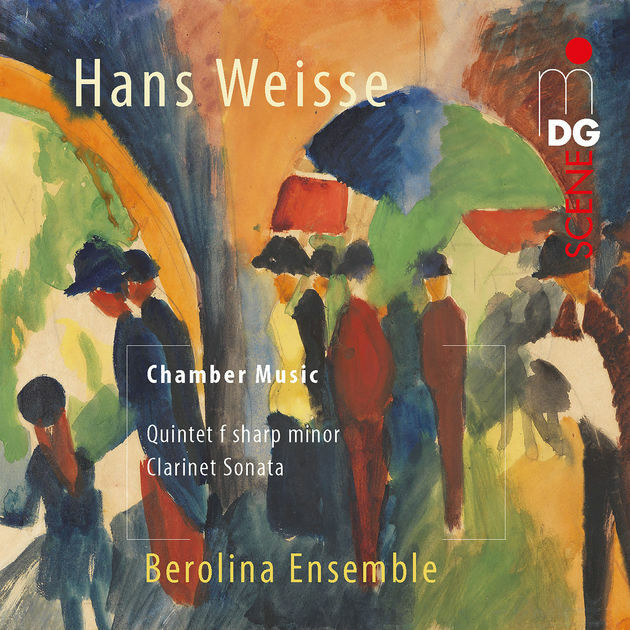 Also, Weisse tends to use relatively short melodic motifs, but somehow manages to develop them into substantial works, the quintet alone is 43 minutes—so he was clearly a master of Auskomponierung (elaboration/composing out). Of the two works, the Clarinet Sonata, written in 1921, is the more successful. The style is achingly close to Brahms, even to the point of inadvertent imitation. Its three movements are as well structured as we would expect from a music theorist, but the layout is unusual, the second movement an elaborate and diverse scherzo, the last movement slow, although suitably scaled to end the work. Broad arpeggios range across the piano in accompaniment to sprightly and unpredictable clarinet lines, the solo work always lyrical and rarely going to any extremes of dynamic or tessitura. Clarinetist Friederike Roth opts for a more Romantic than analytic approach, which is for the best, and we remain in a Brahmsian sound world throughout. Her tone sometimes narrows excessively in the upper register, and also goes course in the few loud sections—both surprising flaws given the apparently straightforward nature of the writing. Pianist Viller Valbonesi also finds a suitable atmosphere, subtly shaping his arpeggios with a slight and nuanced rubato. The Clarinet Quintet dates from 1926, so both works predate Weisse’s move to the States. It starts in a declamatory mode, with a decisive falling motif from the strings, but soon settles in to an amenable contrapuntal style. The clarinet rarely dominates the Vordergrund, and often doesn’t play for long stretches. Even when she does, she is sometimes difficult to pick out, but it is difficult to decide if this is a flaw of the present ensemble or Weisse’s instrumental writing. A few moments of scrappy ensemble from the strings are highlighted by the clarity of the textures and the quality of the audio, but they don’t detract. The fact that the Clarinet Sonata does not have a slow movement proper is all the more sad for the quality of the slow third movement here. Weisse finally relaxes his contrapuntal rigor, and gets a little more adventurous with his harmonies, though there’s still nothing here to irk Brahms. The recording sound is up the usual high standards of MDG. A vibrant bass response serves both the piano left hand the cello well. Surround sound brings atmosphere and warmth, but not at the expense of detail. A satisfying and intriguing release, presenting a new name amongst the Brahms imitators, and very possibly the Brahms-imitator-in-chief. This review appears in Fanfare magazine issue 42:3. 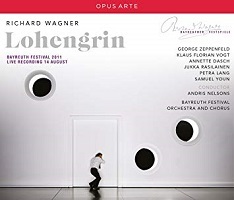 These two recordings from Bayreuth, the Meistersinger made in 2008, the Lohengrin in 2011, have previously been available on DVD and Blu-ray, and the various merits or otherwise of the provocative stagings discussed in many reviews. Now they are available as audio recordings (there is also a Tristan, from 2009 released as Opus Arte 9033), taken directly from the video soundtracks. Given that these are already available in surround sound, Opus Arte has missed a trick in not releasing these in SACD—Meistersinger in particular is poorly served in that medium—but given the controversy surrounding both productions, it is good to be able to focus on the musical performances, both of which have considerable merits. Katharina Wagner’s Meistersinger was a statement of intent, produced before she took over the running of the festival and taking a refreshingly confrontational approach to the work’s dynamic of tradition and innovation. We are in a modern-day setting, and the Meistersingers are conceptual artists. Ghosts of the past appear in the form of dancers wearing huge heads representing famous composers in caricature. Most radically, Katharina Wagner changes the dynamic of the song contest, making Walther into a sentimental traditionalist and Beckmesser into the more engaged and contemporary artist. The whole conception works well on its own terms, and also does a good job of unseating the last of Wagner’s mature operas to have resisted updated staging. Hans Sachs’s final monologue is presented as explicitly proto-Nazi, something that several other productions have taken further since, especially the David Bösch version currently at Bavarian State Opera, but the reimagining of Beckmesser in Katharina Wagner’s production remains a unique innovation. All of which raises the question of how much we can ignore the visual side of a radical production when we are only listening to the music. Conductor Sebastian Weigle gives a dynamic account, but his first concern is always to accommodate the singers, with the result that the tempos, while fluid, are never overly fast or aggressive: The provocation onstage is not reflected in the pit. Even so, changes in the dramaturgy are evident. When David (Norbert Ernst) tells Walther of the rules of the singing contest in the first act, it is clear that there is a darker edge here than usual, that an irony is also being expressed. Concessions also need to be made for a lot of stage noise (the Bayreuth audience, of course, is silent, though there are loud boos at the end), and a note in the liner tells us that Sachs’s cobbling in the second act is represented by a typewriter. The typewriter also returns briefly in the third act, a similarly annoying addition. These inconveniences aside, the musical performance is very fine, with a cast, chorus, and orchestra of a quality that only Bayreuth and a few other German houses could hope to muster. Franz Hawlata has a suitably agile but authoritative voice for Sachs, and dark enough, too, for the sinister dimension that Katharina develops, though he loses some tone in the last act. Wagner fans should know by now where they stand with Klaus Florian Vogt, and if you are a believer, he is as good here as anywhere. Eva is one of the few characters that Katharina fails to find anything interesting to do with in the production, but Michaela Kaune holds her own in the audio version, as does Carola Guber as Magdalene. The production’s reimagining of Beckmesser is clearly audible in the performance from Michael Volle. There’s little comedy here, and instead a certain malicious edge. He has a great voice though, certainly equal to the part. Moving on to Lohengrin, we find ourselves in a behavioral laboratory, with the burghers of Brabant all represented as lab rats. This production has so far been the only unqualified success of Katharina Wagner’s tenure, though its successor, directed by Yuval Sharon, has also received plaudits, though I found it much less interesting. The audio-only version demonstrates how much less tension there is here between the work and the staging than in the Meistersinger. None of the roles are reinterpreted to the extent that they are sung differently, nor is there any noticeable stage noise, nor any booing at the end. Lohengrin has become a signature work for Andris Nelsons, and his reading alone would justify the release of this set. His pacing is dynamic and dramatic, but also flexible and lyrical, always accommodating the singers, but never deferring to them in the way that Weigle seems to. The recording boasts another strong cast, headed again by Klaus Florian Vogt, as distinctive, and therefore probably as divisive, as ever. Annette Dasch is suitably innocent and pure of tone as Elsa, more so than Anja Harteros in the latest Bayreuth production. Georg Zeppenfeld is a spectacular Heinrich, noble and rich of voice, but also expressing an undertone of vulnerability and indecision. Both Zeppenfeld and Petra Lang, as Ortrud, are in the new Bayreuth Lohengrin, but Lang’s voice has noticeably deteriorated in the years since this recording. Here weaknesses are apparent, but the color and emotion of her voice, and the sustained power in the upper register, are always thrilling. Jukka Rasilainen is a malicious-sounding Telramund, not easy on the ear, but a good partner to Lang. Packaging for the two sets is minimal, each with a cast, cue list, and synopsis, but no libretto, and production stills only on the covers. The Lohengrin gives a single date, August 14, 2011, while the Meistersinger does not, suggesting the latter has edits. Both recordings are strong contenders. The Lohengrin is the finer of the two, although the Meistersinger might come off better commercially for lack of competition among modern-audio releases. The Lohengrin is up against a superior SACD version from Seymon Bychkov and the WDR SO on Profil (PH09004), which also features a fresher-voiced Petra Lang. The Oehms (946) release from Frankfurt Opera with Bertrand de Billy received good notices, but I haven’t heard it. Then there is the Mark Elder version with the Concertgebouw (RCO Live 17002), which is in SACD, but is let down by a decidedly mixed cast. Also in SACD are the concert versions in the Pentatone cycle with Marek Janowski (now in a box set: 186700). The Lohengrin there shares Vogt and Dasch with this version, while Zeppenfeld appears as Pogner in Meistersinger. For me, Janowski’s fast, unyielding tempos and insensitive phrasing discount the entire project, but others may feel differently. That is currently the only SACD version of Meistersinger available, making the red-book specification of this release particularly lamentable. Elsewhere among modern recordings, the Glyndebourne DVD has recently been rendered in audio-only format (as Glyndebourne 21), and is an attractive option, especially for the young but talented singers in the lead roles. Otherwise, the most recent alternatives are from the last century, and most have detractors for one reason or another, the Solti Chicago version, the Jochum/Fischer-Dieskau, Haitink and Covent Garden, Barenboim at Bayreuth. 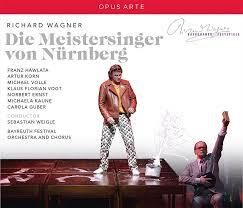 Against all of those, Weigle’s Meistersinger comes up as a surprisingly dependable and consistent alternative.